After much debate, the mod team here at the Superman Movieverse Fanfiction Awards has decided to not hold the awards this year, since the volume of fic produced over the last year has been so low. The awards *will* return next year, however, and the 2013 Superman Movieverse Fanfiction Awards will be open to all fic written between June 1st, 2011 and May 31st, 2013, so that nothing gets lost or overlooked. The release of Man of Steel next year should also help bump up the volume of fic, so that we won't have another year with no awards for quite a while. Thank you to all the writers and readers out there, and here's to lots of good new fic written over the next year. See you all in 2013! All right, everyone, the results have been tabulated, the banners are made, and here it is at last: the final winners list for the 2011 Superman Movieverse Fanfiction Awards! The link to ALL the banners is here, made by the lovely januaried . Remember to save the images and host them on your own site. Please do NOT hotlink directly to this folder! We're trying to keep the bandwidth down so everyone can use the same site. Many thanks to the maintainers of the comm, who put in so much effort this year, and to every one of you who nominated and voted during the awards! We will leave the voting open until 3 AM Eastern time tomorrow night (which, if unlike me you know what day it is, is actually the 15th). In other words, if you have not yet voted, you have just over 24 hours in which to do so! Get to the ballot page and cast your vote! We would like to offer ALL our wonderful nominees the chance to advertise the success of their fic and encourage their fans to vote with the use of banners. Post the banner on your LJ, on message board posts, or wherever you would like to show off your status as a nominee. Congratulations to all the nominees and best of luck throughout the voting process! Remember to replace your_banner_url_here.jpg with the URL of your banner image! The nominees in each category are in no particular order. BALLOT IS NOW OPEN CLOSED. Final Winners will be posted July 15, 2011. Remember to put your USERNAME and DOMAIN (i.e. anissa7118 at LJ, or saavikam77 at fanfiction.net) on the final question of EACH BALLOT. Unsigned results WILL NOT BE COUNTED. Refer to the nominated stories list below to catch up on your reading. Authors, unlike during the nominations process, you ARE allowed to vote for your own stories, . Important: Go through this page once you are ready to cast your final vote, as the survey links may need to be updated. Once again, due to restrictions on the number of questions per survey imposed by the Zoomerang survey service, we had to split the final ballot into 5 parts. The moderating staff apologizes for any inconvenience. Remember to enter your username on each of the five ballots, please! We're experiencing some interesting times here. Expect the ballot to be open sometime late tonight or early tomorrow morning. The deadline has passed, and nominations to the 2011 Superman Movieverse Fanfiction Awards are now CLOSED. Fortunately, we did receive enough nominations to hold the awards this year. Watch this comm for links to the survey; the ballot should open in the wee hours of July 1st. In Dire Need of Noms! Okay, folks, the deadline for nominations is Monday June 27th at 11:59 Eastern time. That's just 2 days left. So far we have received exactly TWO nomination ballots. Two. Each of those was nominating a single fic. That's not enough to have a fair and balanced awards. The community maintainers are trying to make sure we have a complete ballot, but we want YOUR favorite fics nominated. If you want to see your favorite stories on the ballot, YOU have to nominate them. Don't just hope that someone else will do it for you - take ten minutes and make some nominations. ETA: Last year's winners in these categories are not eligible this year. Please check the 2010 Winners List before making nominations. Oops, I forgot to put up the graphics links and such. Here are the ones we have so far, made by the glorious januaried . Now for the request part. We need more promotional graphics - banners, icons, the works. The only requirements are that the images relate to the Superman Movieverse and that the graphics have some text about the awards. For icons, "2011 Superman Movieverse Fanfiction Awards" is all you need. For banners, we'd prefer that they also have the dates (June 1st through 27th for nominations, July 1st through 14th for voting) and maybe the URL of the awards community. Please help us out, graphics makers! We'd love to see a variety of styles so we can promote the awards all over the place with your awesome image skills. Last but not least, don't forget to nominate fic for the awards this year! 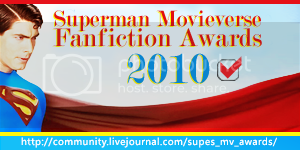 Here is the place to help compile a list of eligible stories for the 2011 Superman Movieverse Fanfiction Awards. If your story was written or updated between June 1, 2010 and May 31, 2011, and is set primarily in the Superman movieverse (even AU versions), it is eligible! Please comment on this thread with the link to your story here, first chapter preferred. If you have a Table of Contents, even better. If we are missing any sites in this list, please also add them in comments. If you already have a post with your eligible stories listed, please link that instead. This post will be updated with the links as they are received. Thanks! Finally, please also double check the list of last year's winners before submitting a story. Remember, no story, scene, or character can win the same award two years in a row. Eyes Skyward Fanfic Forum ETA: Links to eligible fic are being collected here. ETA: Some fics can also be found on AO3 under the Superman Returns and Reeveverse tags. Check dates for eligiblity. ETA: There are also fics from the Superman Movieverse Pairings Challenge Masterlist. Make sure to check the date for eligibility. See comments for eligible stories from individual authors! Nominations for the 2011 Awards Are Now Open! There have been a few changes to the rules this year to hopefully make the awards more user-friendly. Changes will be noted in bold red font. If you have any questions, please email any of the maintainers of the community for clarification. * Any person who won an award in the Best People category in the preceeding year is not eligible for the same award in the current year. In other words, the Best Author, Best Beta, and Best Reviewer categories cannot be won by the same person in consecutive years. * You may nominate a different moment of the same fic that won last year's Best Moment Category provided that the moment you are nominating was written during the current year. * The stories may be hosted anywhere online. * The main focus of the story must be the Superman Movieverse (not including Smallville, Lois and Clark, comicverse, etc). * Writers may not nominate their own fanfiction for any category. * Nominations will be accepted between June 1, 2011and June 27, 2011, 11:59pm EDT. You may nominate up to 4 fics per category. It is not necessary to nominate for every category, but it would be appreciated. * Authors may not compete against themselves in any category. If more than one of an author's stories are nominated for the same category, the maintainers may contact the author to determine which story goes on the final ballot. * The top five fics nominated in each category will be placed onto the final ballot. If there are 7 or more fics nominated, at the maintainers' discretion the category will be split into two final categories separated by length. This will not apply to Length categories. - For example, suppose Best Love Scene has 8 nominations. The fics would be separated by length, and the final ballot would show Best Love Scene (Long) for fics over 5,000 words and Best Love Scene (Short) for fics under 5,000 words. Actual word count for the break may vary depending on the fics nominated. * If a runoff ballot is necessary - for Length categories or any other reason - it will take place between June 28, 2011 and June 30, 2011. * Voting will take place between July 1, 2011 and July 14, 2011 using a non-LJ-affiliated survey service. * Awards will be announced on July 16, 2011. Please do not "Join" the community! All participants may nominate and comment on this entry, either using OpenID, LJ username or Anonymous. Instead, LJ users should click "Watch This Community" to stay up-to-date on the nomination and voting process. * Submit your nominations in comments to this entry. * Please indicate "Nomination Ballot" in the Subject Heading of your comment. * You may nominate up to four fics per category. * You do not need to nominate in every category. * Make sure your nominations are clearly marked for each category. * Include the URL of the fic (or chapter of the fic for specific moments) in your nomination. * For moments, please be as specific as possible about where it is located (chapter number, thread page, etc). * Comments will be screened. Non LJ-users should leave an email address in the comment if you would like confirmation that your nomination was received. Hello everyone, it's the end of May and we all know what that means ... Awards Season is almost upon us once again. Start getting ready for the Fifth Annual Superman Movieverse Awards! A post with the complete category list and rules will go up by June 1st, when we will begin accepting nominations. Authors, start assembling your Eligible Work lists - as usual we will have a post where all of you can link to those lists for your readers' convenience. Stay tuned to this comm for more information! My deepest apologies for the delay; real life was very intense last weekend (my first ever family reunion, with 70-80 people!). Here are the banners. Congratulations to all the winners, and thanks to all participants for writing, nominating, and voting! Do not hotlink these banners! Upload them to your LJ Scrapbook, Photobucket, Tinypic, or your image host of choice. Please be sure to notify us of any errors. Banners can be corrected. Credit for banners goes to januaried. Final winners' banners will arrive later this week. Nominee banners can be found here. Credit for all banners goes to januaried . Please be sure to notify us of any errors! Please PM me with an email address if you have any questions or concerns. Hey folks, the results are in and I'm just formatting the entry for the Final Winners list. I do have to handle some RL errands first, but the results WILL be posted tonight, along with all of the nominees. Thank you for your patience! Voting in the 2010 Superman Movieverse Fanfiction Awards is now CLOSED. Final winners will be announced later today. Banners for the winners should be available later this week. Thank you to all of the authors, readers, betas, and reviewers in our fandom - thank you to everyone who moderated, nominated, fact-checked, and voted. These awards exist because of and for all of you. Less Than 12 Hours Left to Vote! We now have less than 12 hours until the ballots will be closed and voting ends for the 2010 Superman Movieverse Fanfiction Awards. Many of the categories are still close, so if you haven't voted for your favorites, please do so now! This is your best chance to let your favorite stories and authors shine. Confirmation of the vote has been sent to everyone who put down an email address for verification. Just one day left for voting! There's just one more day left for voting in the 2010 Superman Movieverse Fanfiction Awards, as the ballot closes at 11:59 PM EDT on July 17. Don't let the opportunity pass you by to vote for your favorite fics!